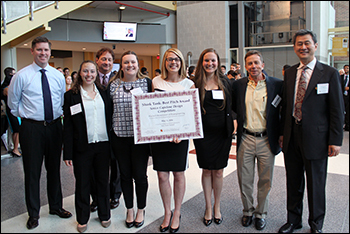 Members of the BioE Class of 2016 with their mentors, BioE faculty and Capstone judges. 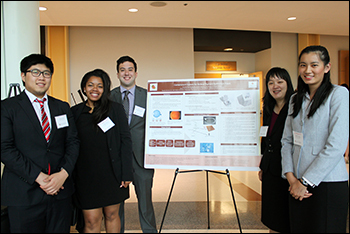 Demonstrating the myriad ways in which bioengineers are transforming human health innovation, the Fischell Department of Bioengineering (BioE) 2016 Senior Capstone class exhibited a total of 20 novel concepts during the Capstone II finale on May 11, 2016. Projects ranged from a device to improve the MRI experience for pediatric patients, to an affordable, portable testing technique that could help underserved populations test for certain diseases. 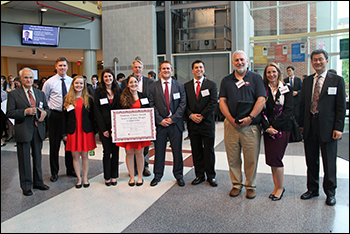 The 2016 Capstone Design Competition marked the biggest yet, as 98 students pitched their products to a panel of esteemed judges, as well as to BioE faculty and fellow students. 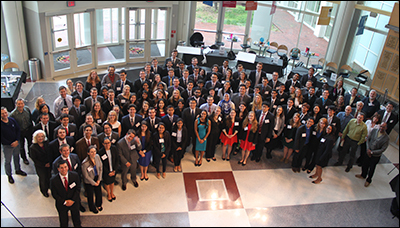 Created and sponsored by Mrs. Susan Fischell, wife of A. James Clark School benefactor Dr. Robert E. Fischell, the Capstone Design Competition has been a marquee event, capping off the end of the academic year. Lung ailments are one of the world’s leading causes of death, yet there are still limited diagnostic capabilities for these lung ailments. Current methods for diagnosing lung ailments are often either too expensive or inconvenient for both physicians and patients; additionally, some methods yield inaccurate results. Airflow perturbation devices (APDs) are a new brand of lung ailment detection devices that detect the inhalation and exhalation airway resistances in order to aid in the diagnosis of disorders such as COPD or asthma. 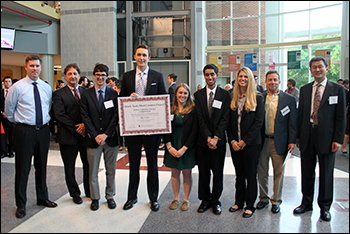 The goal of Group 1's project was to improve the functionality of Dr. Arthur Johnson's patented APD device. The team focused on developing a new software package compatible with smartphone systems, specifically Android and iOS, as well as with computers. Group 1 team members set out to create a package capable of seamlessly transferring data from the APD to computers and phones to allow for efficient clinical and home use of the device. At the time of writing their project abstract, the team had created a software system using Java, CSS, HTML, and NodeJS that allows for measuring air flow perturbations on the computer. The group was been able to read and display real-time data from the APD, something the previous on-system software was incapable of doing. From this data, Group 1 is able to measure lung resistances that they hope will, in the future, be used to make diagnoses in patients. Overall, the project represents the first major steps in overhauling the APD to modernize it and expand its software suite to multiple systems, Group 1 says. "We believe these improvements will significantly increase the marketability of the APD and expand the user base of this device from clinicians to a more modern home use application as well as make it a more competitive product versus existing technologies," the group wrote in their project abstract. Concussions are endemic in today’s society and symptoms range from relatively benign - such as dizziness, nausea, and sensitivity to light - to substantial cognitive impairments or psychological disorders such as depression and anxiety. The effects of concussions vary wildly, and up to 2/3 go undiagnosed and thus untreated, Group 2 said. Current standards of diagnosis include Magnetic Resonance Imaging (MRI), which is used to rule out internal bleeding, and interviews complete with standardized scales for symptom severity. Acute care for concussions costs the nation up to $10 billion annually. As such, Group 2 feels stronglt that a new method of diagnosis that is less expensive, more reliable, and more widespread is sorely needed. Previous research shows that saccades, which are rapid, involuntary eye movements, become impaired after a patient sustains a concussion. 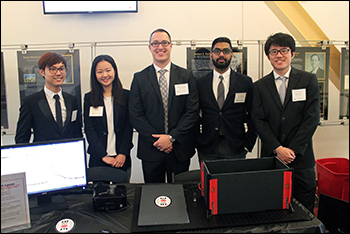 Recognizing this, Group 2 set out on a mission to develop a camera system mounted to goggles that could track eye movement relative to a stationary point in order to diagnose concussions via analysis of saccade movement. The position of the pupil would be tracked over time at 380 frames per second, and then the derivative of the position is taken to give velocity measurements, as saccades move quickly relative to normal eye motion. Stroke occurs when blood flow to the brain ceases, causing acute hypoxia within minutes, which can lead to massive cell death. Individuals who experience a stroke often live on with hindering effects, which can be physical, cognitive, or even emotional in nature. One physical after-effect is a limited range of coordination and muscle movement on one side of the body. When muscles are very tight and stiff, this is called spasticity. Spasticity in the hands and fingers can range in severity - anywhere from a constant, slight flexion of the fingers, to a permanently clenched fist, despite brain signals to do otherwise. This spasticity prevents stroke patients from completing basic and everyday tasks on their own. 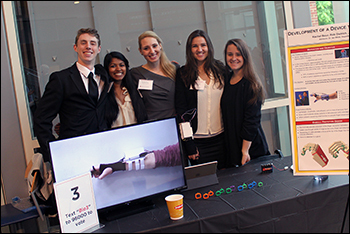 Recognizing this, Group 3 aimed to design and manufacture an external device that will mechanically assist hand motion in mild to moderate cases of hand spasticity in stroke patients by actuating extension of the fingers. While there are current technologies on the market today, such technologies target rehabilitation; whereas, Group 3's proposed device is to be worn at all times to assist in completion of basic everyday tasks. In addition, the proposed device would be focused on cost efficiency, breathability, comfort, ease of use, customizability, and functionality. The external device consists of a series of rings along the finger that are connected by a fishing wire attached to the shaft of a servo motor mounted on the wrist. The movement of the servo is actuated by strain gages that pick up extension of the wrist, since most stroke patients retain greater wrist functionality than finger functionality. Once the servo is actuated, the shaft of each servo moves through the body of servo, pulling back the fishing wire as well, effectively shortening the wire and pulling the finger into extension. Through this way, Group 3 hopes their device could give stroke patients the ability to manipulate their hands and fingers. The objective of Group 4's project is to develop a drug delivery localization medical device that can be non-surgically, endoscopically implanted and removed from the lung. To accomplish this objective, the group created a device similar to an intrabronchial valve, an FDA approved non-surgical device that is implanted endoscopically for lung occlusion. The modified intrabronchial valve is meant to occlude the airway upstream from the tumor to prevent airflow into the diseased portion of the lung and to prevent chemotherapeutic drugs from flowing upwards into healthy parts of the lung. The device is also meant to allow a syringe to pass through a valve allowing drug delivery post-airway occlusion. This one-way flow through the valve will allow occluded airways of the lung to receive a targeted dose of chemotherapeutic drugs. The group's long-term goals include decreasing time of chemotherapy drug administration and increasing accessibility of lung cancer treatment. Further uses of this device could also include treatment of fungal and bacterial infections in the lung, Group 4 said. Polymerase chain reaction (PCR) is a process by which nucleic acid becomes amplified via repetitive heating and cooling cycles. 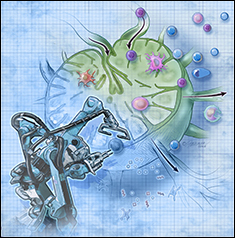 Using primers, free nucleotides, and temperature cycling, it enables small nucleic acid fragments to become amplified by a factor of hundreds of millions. PCR for the detection of specific DNA or RNA sequences is used for clinical diagnosis of several diseases. Currently, the cost - which ranges from a few thousand to tens of thousands of U.S. dollars - and power requirements for the average PCR machines on the market render their use unfeasible in clinically underserved areas and developing countries, where PCR is often necessary for making diagnoses. HIV positive breastfeeding mothers in rural sites, for example, rely on PCR-enabled testing of infants to detect elevated HIV titers. For infants, it is not possible to use antibody tests when trying to make an HIV diagnosis, as infants carry their mother's’ antibodies for several months. This test, therefore, would not be accurate. The only way to make a diagnosis for those exposed to maternal HIV in utero is to perform PCR on collected blood samples. For these and additional reasons, a portable PCR machine can provide a method of obtaining fast results. As such, Group 5's project aimed to bring the clinical uses of PCR to an accessible level for underserved patients in these communities. By using a positive temperature coefficient (PTC) heating element, temperature sensor, and camera module, Group 5 designed and developed a cheap and effective thermal cycler. This device is smaller, more portable, and much cheaper than existing PCR machines. In order to reduce the technical expertise required to function in such settings, where refrigeration and transportation of samples to laboratories are also challenges, Group 5 aimed to implement real-time amplification measurement capabilities, allowing the device to function as a temporary point-of-care diagnostic device. Macular degeneration (MD) is a medical condition that is caused by damage or deterioration of the retina and the ocular tissues around the retina. This condition affects millions of adults in the United States alone and is the leading cause of vision loss. Tears or ruptures in the ocular layers are caused by atrophy of the retinal pigment epithelium (RPE). The RPE is a monolayer of cells that are located at the back of the eye. To combat this issue, the National Eye Institute (NEI) of the National Institutes of Health (NIH) has created an RPE “patch” that is placed at the rupture. Scientists believe that the use of an RPE patch immediately after injury will help prevent the rupture from growing, thus preventing RPE atrophy and subsequent vision loss. The NEI has created an autologous RPE patch to treat patients that suffer from macular degeneration. 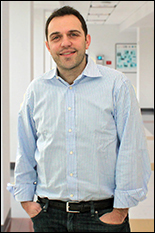 This patch employs the use of pluripotent stem cells. Two of the challenges associated with the use of the RPE patch, however, is the lack of a method to transport it to areas outside of a lab environment and the need for methods to store the samples once thawed while maintaining cell viability and full functionality. The goal of Group 6's project is to create a containment system that, when activated, can defrost the media and tissue sample using a controlled heating mechanism while simultaneously maintaining sterility. All surgeries require control over blood vessels and other high­-risk tissues to minimize the damage to patients. In thoracic surgery, surgeons must take particular care to access and clamp off several major blood vessels without tearing or cutting them. The pulmonary artery is the most fragile blood vessel that thoracic surgeons must gain control over because it is both a large and a very low pressure artery. The current method used to gain proximal control over this particular artery is incredibly risky due to the number of instruments involved and the length of time spent on this one step. In some cases, the surgeon fails multiple times to successfully wrap the artery in surgical wire. For each failed attempt, the patient time on the operating table is greatly extended and the potential for a mistake or bleeding to occur increases. Furthermore, the current method requires the surgeon to spend a vast amount of time removing tissue around the artery in order to allow enough room for him or her to loop wire around the artery. 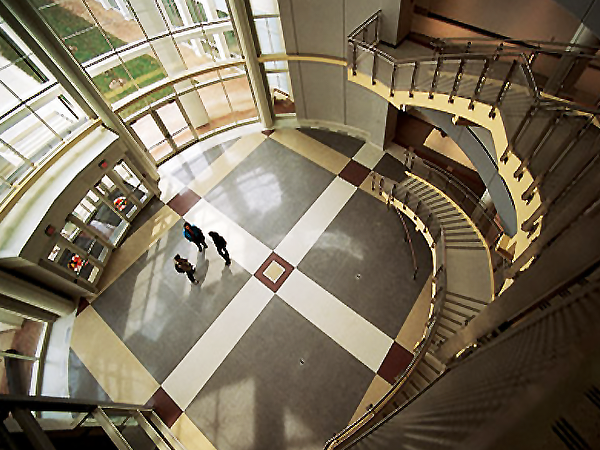 The current method was tested within a Fischell Department of Bioengineering laboratory using standard operative tools. Sometimes, when pulling the wire around the artery using the current method, the surgeon can mistakenly grab and pull off excessive tissue attached to the artery or tear the artery, which will result in scarring or catastrophic bleeding. Laparoscopic surgery is a minimally invasive procedure that is becoming increasingly popular due to its decreased risk of infection and shorter patient recovery times, compared to open surgery. For suturing internal wounds, surgical sealants are gaining traction as a potential replacement to traditional stitches or staples. A copolymer solution has been developed that can be applied to internal wounds and hold them together as they heal. The most effective way to administer this copolymer system is through solution blow spinning. Blow spinning the special copolymer creates nanofibers which, when warmed by the physiological temperature of the tissue, cause the copolymer to shift into a glassy transition state where it can adhere to the wounded tissue. These nanofibers are biodegradable through hydrolysis, making them safe for use in vivo. Ultimately, this system results in less scar tissue compared to traditional sutures since there is an even pressure on the wound. The limitation, however, is that currently the polymer can only be applied outside the body during open surgery. 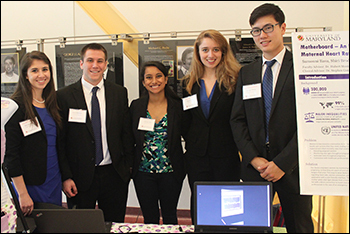 In order to deliver the blow spun nanofibers during a minimally invasive operation, Group 8 proposes a laparoscopic blow spinning device. Oxygen saturation level is a key vital sign used in clinical medicine today. Severely low levels of oxygen in the blood can lead to hypoxemia, causing cellular hypoxia, organ dysfunction, and even death. However, the instrumentation used to measure oxygen saturation does not operate with the desired reliability for such an important metric, Group 9 said. A pulse oximeter is a noninvasive device typically used to measure a patient’s oxygen saturation, but this apparatus has significant limitations in certain patient populations. False or inaccurate readings are often found in patients with poor peripheral circulation, vasodilatory states, or vasoconstrictive states. In order to obtain this measurement in these patient populations, the Intensive Care Unit must conduct a very painful, invasive procedure known as an arterial puncture, and draw a significant amount of blood from an arterial catheter in order to conduct the arterial blood gas test. 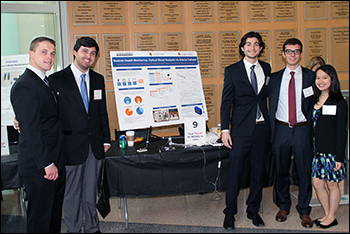 The device that Group 9 is designing, however, aims to externally check hemoglobin saturation in addition to other vital clinical parameters through the arterial catheter by analyzing how the absorption of blood at different wavelengths changes with different physiological conditions. It is important to note that this blood can be returned to the patient so they do not lose a drop of blood in the process, Group 9 said. This ensures a real-time reading with immediate results so that a clinical decision can be delivered in a timely manner while keeping the patient as comfortable as possible. Group 9 says their device will also reduce the number of blood samples sent to the lab. On the side of the patient, this will reduce the amount of blood taken each day, since there is no blood loss when using Group 9's device. On the hospital side, this will reduce the number of lab test sample samples. "Blood gas tests cost time and money, so the hospital will be able to save money on laboratory tests while using the laboratory’s time more effectively," Group 9 said. "We are designing the device to have two components: a sensor that will clamp on to the arterial catheter tubing and record measurements, and a display which will contain a processing unit to compute data based on these measurements. For this prototype we seek to create a device that will measure hemoglobin saturation, and pH. In the future, we plan on using higher quality materials and creating a device that can record more physiological parameters using this method in order to provide both doctors and patients with more costeffective and real-time readings while keeping the patient’s comfort in mind." The goal of Group 10's project is to develop a medical device that is capable of assisting in the rehabilitation of hand disability following a stroke or any other brain injury that impairs normal hand function. Their proposed device is a glove that makes use of actuator filaments to assist the hand and finger muscles in grasping and ultimately lifting simple objects, such as a foam ball. Although the preliminary design will target adolescent stroke victims, ideally, the glove will be expanded to encompass more shapes and sizes and would also have a further range of application, Group 10 said. The glove aims to provide rehabilitation exercises to the patient by providing different forces in which the hand must work against to regain strength and motion. These exercises may be personalized to each individual according to the severity of his or her injury. Group 10 optimized their device by eliminating the cumbersome weight and motion limitations associated with a few preceding models. While the group says that their device is not yet ready to be a completely at-home system, as of ths year's Capstone, the group is confident that, with a few tweaks and some more automation, at-home use would be possible and could save costs for prolonged treatment. It is common for pediatric patients to have a fear of needles, which often increases the amount of time it takes clinicians to administer vaccines. 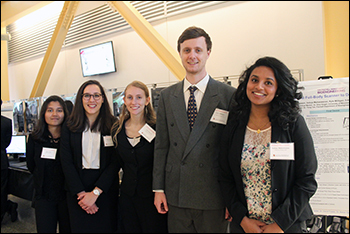 Group 11's proposed project, named microVax, is a needless drug administrator for pediatric patients that relies on a pressure-driven system, and thereby aims to increase patient comfort in vaccinations. The microVax exploits the function of a sphygmomanometer for this pressure gradient, a familiar device for pediatric patients. The microVax administration system is a sleeve with three cartridges pre-filled with vaccine, and it sits between the patient’s arm and the sphygmomanometer. The sphygmomanometer applies pressure to the cartridges that shear adhesion on inner braces at a certain threshold. Upon shearing, the cartridge compresses and delivers the vaccine into the patient intradermally to create less pain and use less vaccine. The microVax sleeve prototype was constructed using a Makerbot 3-D printer, athletic captain bands, Velcro, and a sewing machine. Funding is needed for injection molding and industrial sewing in order to fabricate the final microVax. Between 15-25 percent of hospitalized patients receive urinary catheters during their hospital stay. Catheterization longer than six days is strongly correlated with Catheter-Associated Urinary Tract Infections (CAUTI). 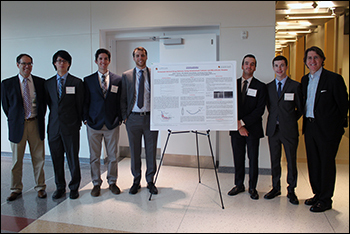 To reduce the incidence of CAUTI and decrease treatment costs of healthcare-acquired infections, Group 12 proposed the development of an ultraviolet (UV) selfsterilizing catheter. To test the feasibility of this proposal, the team fabricated a catheter containing a UV diffusive optical fiber in its inner lumen and coated internally with aluminum. 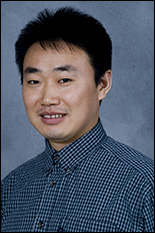 The reflectance and transmittance of the aluminum coating and optical fiber adhesives and sealants were quantified. Finally, the bactericidal efficiency of the optical fibers and the prototype catheter was tested. Results showed that the internal aluminum coating prevented transmission of UVC light externally through the catheter walls (less than 3 percent light transmitted), which indicates that most of the UVC light is reflected or absorbed by the aluminum. Non-diffusive optical fibers inhibited E coli growth, whereas diffusive fibers did not inhibit growth. Due to use of diffusive fibers in the prototype, bactericidal efficiency of the catheter was not demonstrated; however, effective experimental setups and protocols for future catheter testing were developed. 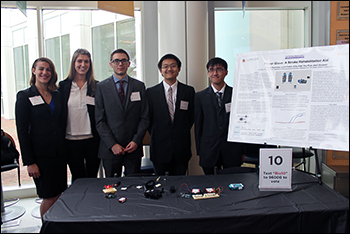 Group 12 noted that future work will focus on selecting diffusive fibers with improved UVC transmittance, testing additional prototype catheters for bacterial efficiency, and eventually designing a manufactured catheter for clinical use. An emergent cricothyrotomy is a procedure used by medical professionals to establish an airway in what is referred to in medicine as a “can’t intubate, can’t ventilate” situation. This emergency procedure is performed as a last-resort after several failed attempts to establish an airway through traditional oral or naso-tracheal methods. Cricothyrotomies are most frequently performed in a prehospital setting defined by a high-stress environment with improper lighting and a lack of resources. However, training for medical providers is completed in a didactic setting with either simulators or cadavers. The current state of training sacrifices many characteristics of the procedure that contribute to the success or failure of the provider. In order to better address the training needs of medical providers, Group 13 created the Cricothyrotomy Trainer. This device is a form and functional prototype of a more realistic, cost-effective, and accurate simulator. The design concept is simple, but novel: the body shell is a permanent structure with a 3’’ by 2’’ extraction in the neck cavity for the replaceable tissue insert. The insert combines the realistic quality that is offered by a cadaver and the reusability of a simulator. The neck cavity also houses a permanent structure that simulates specific cartilages that are necessary landmarks when performing cricothyrotomies, providing more anatomical accuracy than most simulators currently available. A partially replaceable unit mimics the trachea with an air gasp mechanism, allowing a simulated lung to inflate upon successful airway establishment. The simulator is coupled with a program to mimic and display the dwindling vital signs of a true patient during three situations in which a cricothyrotomy may be performed, putting realistic pressure and time constraints on the user. Cricothyrotomy Trainer was created with the purpose of improving the quality of cricothyrotomy training for medical professionals so that they are better prepared when performing cricothyrotomies in the field, improving the success rate of the procedure and ultimately saving lives. There are approximately 1.45 million open heart and total joint replacement surgeries each year, and up to 2.2 percent of these surgeries induce blood clotting, Group 14 said. Anesthesiologists work to minimize this risk by maintaining natural coagulation concentration and interaction with anticoagulants. However, they are severely limited because they cannot track protein concentrations constantly at the point of care. Currently, anesthesiologists use a combination of the patient’s previous medical information and general coagulation profile for dosing. Profiles are provided by machines that determine the clotting time of blood in response to activation or measure the blood’s viscoelastic properties. Due to the nonspecificity of these methods, anesthesiologists can run the risk of overdosing or underdosing their patients with anticoagulants. Alternatively, blood can be sent to a lab for specific protein testing, but due to time constraints, it serves no purpose during surgery. This can lead to a number of challenges for the patient, including some that would require both blood transfusions and a prolonged ICU stay. Recognizing this, Group 14 saw the burden of nonspecific point of care blood coagulation diagnostics as an urgent clinical problem and spent several months trying to tackle many of the associated challenges. 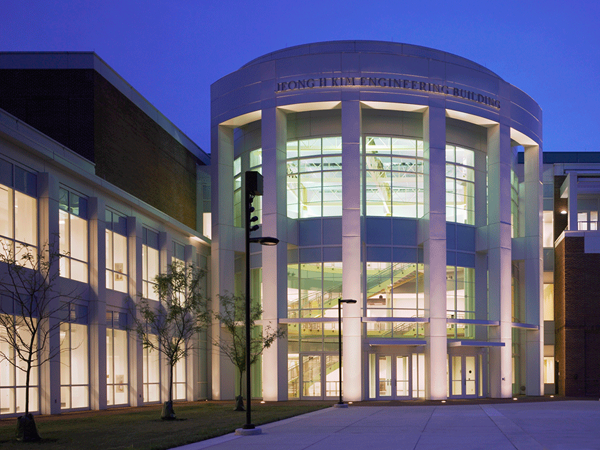 After consultation with Dr. Ken Tanaka, the Director of Cardiothoracic Anesthesiology at the University of Maryland Medical Center, and multiple surgeons, lab technicians, and lab administrators, Group 14 decided that a point-of-care diagnostic device that can measure a patient’s coagulation proteins in a 10-20 minute window would pose a potential solution. Magnetic resonance imaging (MRI) is a painless bioimaging modality that utilizes large magnetic fields and radio pulses in order to visualize structures within the human body. However, MRI machines are daunting, large, make loud sounds, and can be extremely distressing to patients, especially children. A large subset of pediatric patients have to be sedated in order to endure this non­invasive procedure. 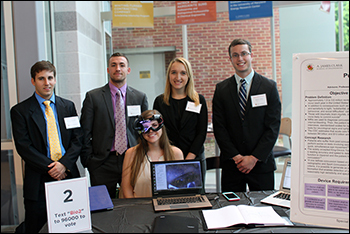 Recognizing this, Group 15 developed a tri­modal, immersive, fear mitigating device that combines a mobile device application with a stereoscopic static image and a projector mirror system. This device will effectively navigate a pediatric patient from hallway to hallway through the MRI machine and eliminate the need for sedation. Pregnant women in developing countries often face a tremendous lack of medical care accessibility. According to the World Health Organization (WHO), 830 women die every day from preventable causes related to pregnancy and childbirth, and 99 percent of these deaths are in developing nations. Therefore, improving global maternal healthcare is a major goal of WHO and one of the Millennium Development Goals of the United Nations. Due to the complications that can occur during pregnancy and labor, such as postpartum hemorrhage (the leading cause of maternal death), it is important to monitor maternal vital signs. These vital signs include heart rate, uterine contractions, and blood loss during labor. While there are currently separate devices to monitor both heart rate and uterine contractions (i.e. electrocardiograms and ultrasound technology), they are widely unavailable in the developing world, and require a trained physician or technician in order to be used effectively. Additionally, there is no commonly used method or technology for the quantification of blood loss, but instead, visual estimation is used in the developing world. This can be extremely inaccurate, and can lead to serious risks during labor. 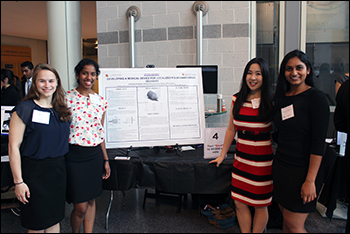 Thus, Group 16 set out to create a cost­efficient, easy-­to-­use device that combines the monitoring of maternal heart rate, uterine contractions, and blood loss during pregnancy and labor. Additionally, this device takes advantage of the use of cellular phones in the developing world by integrating the information from the three monitoring capabilities onto a mobile device application. This device will tell a user whether or not the mother is within a healthy range for each vital sign. In this study, a prototype with the ability to measure heart rate using an EKG circuit, uterine contractions using a self-­reporting uterine contraction monitor, and oxygen saturation levels using a pulse­oximeter circuit was developed. This device provides an important proof of concept for integrating three different monitoring signals onto one application. The group hopes that further studies will show improvement in the accuracy of monitoring heart rate and uterine contraction, and create an algorithm for using blood oxygen saturation levels to determine the volume of blood lost. 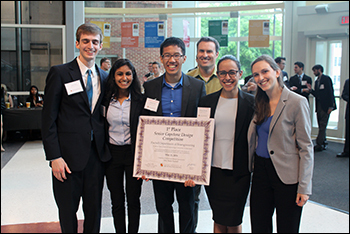 The group feels that this could lead to significant improvement of maternal care in developing countries by providing a series of efficient diagnostic tools for those without access to top-rate healthcare. Physical and pharmacological restraint methods are used on 1.6 million American ICU patients every year to prevent the removal of critical lines and devices. These restraints, which include wrist restraints, Posey vests, mitt restraints, and a plethora of sedatives, result in patient discomfort, confusion and increased recovery time. Furthermore, they are cumbersome and time-consuming for the staff to administer. No device on the market today appropriately and effectively addresses the multiple issues present in current restraint technology, Group 17 said. As such, the group's Sensing Motorized Adaptive Restraint Technology (SMART) utilizes NFC readers and tags to signal motorized retraction of a patient’s wrists if they are close to key devices. The use of removable NFC tags allows the system to protect devices located anywhere on a patient's body. Furthermore, the locking retraction mechanism maintains the highest level of patient comfort. Unless the patient approaches the tagged locations, the retracting device remains unlocked, allowing patients greater range of motion. The SMART system presents an innovative and secure approach to restraining patients without the additional discomfort, stres,s and inconvenience of current methods. Moving forward, the group anticipates that this design will be revised with market-ready components. Early detection of skin cancer greatly reduces the risk of mortality; however, sometimes, due to long wait times for an appointment with a dermatologist, the cancers go undiagnosed and are then able to metastasize. 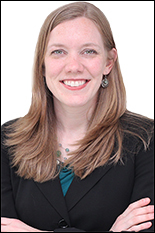 Whole-body screening is desperately needed to compensate for the current gap in systematic standardized surveillance in regards to skin malignancies. 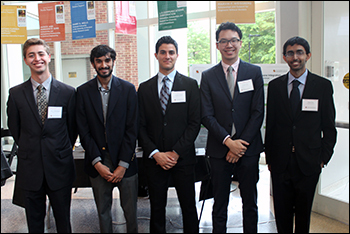 To mitigate this risk, Group 18 proposes to create a multispectral, full-body scanner that will image a patient's skin to identify and track lesions over time. The group intends to construct a scanning system consisting of a platform, rotating motor, and C arm for 360-degree imaging. A camera will be attached to the C arm and the collected images will be reconstructed to generate 3-D spatial data. 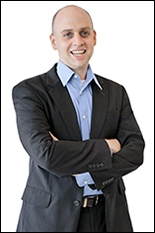 Market research has shown that customer segments include primary care doctors, dermatologists, cutaneous oncology dermatologists, radiologists, forensic scientists, and drug stores (such as CVS, Walgreens, Rite Aid, etc.) Current detection methods include physical examinations, the MelaFind Device, and Vectra WB360. Physical examinations, which are not only difficult to schedule, may also lead to incorrect diagnoses of a skin lesion. The group's proposed device would produce precise and accurate full body scans to diagnose skin cancer as soon as possible, track skin lesions without a patient coming in for a screening, and quantify changes in skin lesions over time. Currently, Group 18's device is in the prototype stage; it is a scaled version that can visually image a model human as a proof of concept. However, in addition to building the model to scale, the group hopes that future work will include incorporating near-infrared and ultraviolet wavelengths into the system and creating flayed images using advanced image processing techniques. According to the American Red Cross, 15.7 million blood donations are collected in the United States in a year, and a total of 30 million blood components are transfused each year. Due to the practical physiological relevance of blood type, a huge amount of labor and material input is put forth annually on the part of hospital blood labs and third-party blood banks to perform successful conclusions on the blood type of newborns and blood donations. The current method of typing blood depends on the visual observation of the agglutination of a given blood sample when mixed with various antibodies; such a methodology is not very efficient because the blood is typed serially and is very labor intensive and time-consuming as a result. In order to solve this problem, Group 19 proposes a novel clinical blood typing method that would significantly reduce the time and labor needed to type blood. In this method, various rare earth nanophosphors of sufficiently varied fluorescence spectra are functionalized so that they may be bound to different antibodies to form nanophosphor-antibody complexes. Blood samples are added to a previously prepared solution of antibodies of sufficient variety to ensure binding. The red blood cells, when mixed in solution with the relevant nanophosphor-antibody complexes, will bind to the antibody complexes to which they correspond, and subsequently moderate the intensity of the fluorescence of the grafted nanophosphors. 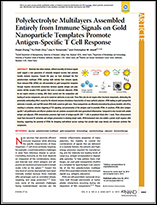 The remaining sample, upon excitation, will emit a distinct fluorescent signature that displays reduction in the intensity of those nanophosphor signals that correspond to antibodies that have successfully bound to the tested blood sample, compared to known control values. Since the results are rapidly and simultaneously obtainable for all tested antigens, it is possible to utilize this method to determine all relevant information regarding blood sample identity in a rapid, accurate manner, Group 19 said. Aerosol therapy has been demonstrated to be a highly effective administration route for medications treating pulmonary disease or injury. A great number of critical patients affected by these conditions must be intubated, creating an obstacle for delivery of aerosol medication. ICUs currently generate aerosols from an external machine, requiring medication to travel through extensive lengths of tubing en route to the lungs. As a result, the millions of patients who are affected by pulmonary disease and require intubation have inefficient particle deposition and alveolar uptake of medications using the current standard of practice, Group 20 said. 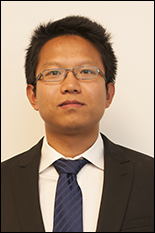 As such, the team proposed an enhanced intratracheal aerosol delivery system to improve the efficiency and effectiveness of administered medication. Previous projects attempted to address the problem by having the medication dosed as a liquid, and by devising a mechanism to nebulize the solution at the distal end of the tube using electronically-generated acoustic waves. 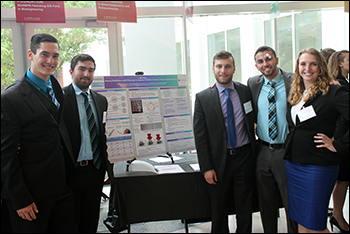 Group 20, instead, sought to utilize the idea of aerosolizing medication close to the pulmonary site of injury and improve upon it by designing a novel catheter nozzle that will nebulize the medication solely through fluid mechanic principles, without requiring any external power. 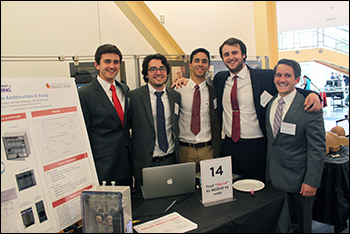 Through their project, the group has attempted to develop the ITDN catheter through use of 3-D printing in order to manufacture microfluidic nozzles that generate an aerosol spray at the distal end of an endotracheal tube in order to deliver a more efficient dosage of medication to intubated patients. Group 20 said they hope such technology could be used to help lower hospitalization costs and reduce the amount of time patients need to remain in the hospital. 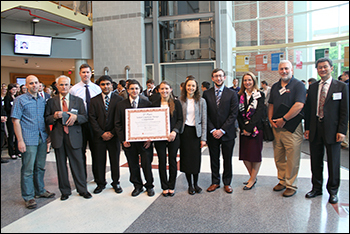 The Fischell Department of Bioengineering would like to congratulate all who participated in this year's Senior Capstone Design Competition and wish the Class of 2016 the best of luck in all future endeavors. 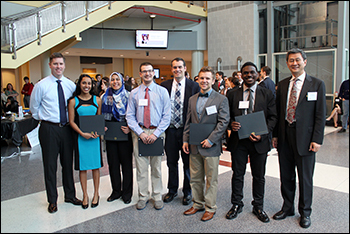 The 2016 BioE seniors would like to thank their professors and mentors (listed with their Capstone teams above); lab staff including Melvin Hill for guidance, time, and labor; administrative staff members for help with financial support and purchasing; Professors Yang Tao and John Fisher; the 2016 judges; and friends in outside academia and industry for the advice and supplies they donated that helped these projects succeed. 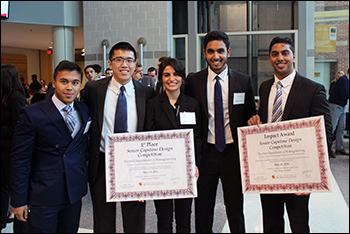 View the full 2016 Capstone Design Competition photo gallery.